With so many social media spaces acting like livewires of sharing and reflecting for the Making Learning Connected MOOC, or CLMOOC, it is easier to forget that a fair number of folks are blogging regularly, too, and that the CLMOOC has a Blog Hub that gathers up blogs in one space. I decided to spend some time this morning, in the space between Make Cycle One that just ended and Make Cycle Two that will soon launch, to read some blogs from CLMOOC folks and make some comments, and collect some quotes that have had me thinking in new directions. I love the close reading that this kind of activity invokes. It’s authentic close reading, not some regimented process that comes from a book by Pearson. I read to seek inspiration, for the words that make me pause. I read to learn. 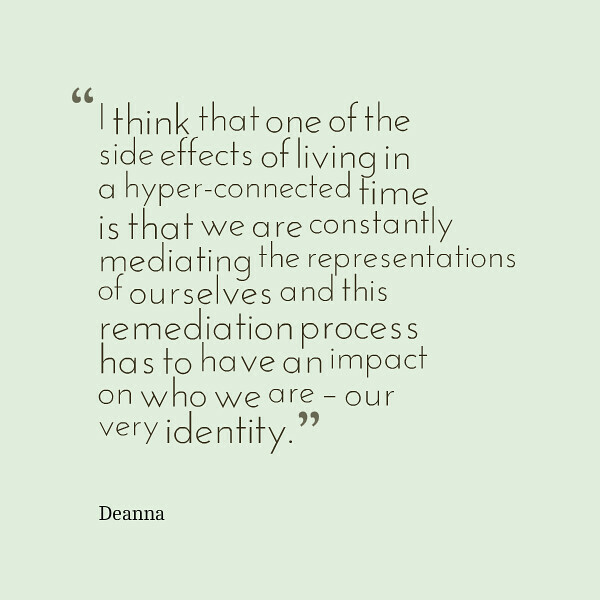 My blog tour began with Deanna Mascle’s post about media and remediation. 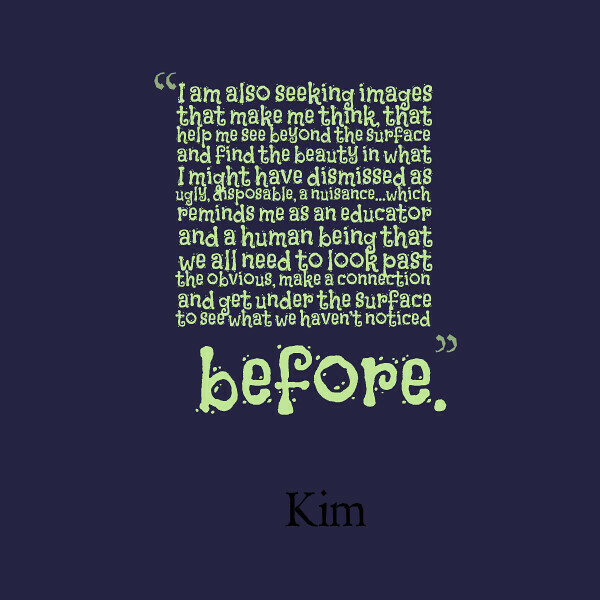 Her journey into identity issues and how technology and digital media impact how we view and are viewed by the world is a critical component of Connected Learning principles, the very foundations of CLMOOC. Is there anything more beautiful than a beautiful photograph? Week after week, I am inspired by the work of Kim Douillard. I am lucky to have her as a friend in multiple networks. Here, she uses her blog to remind us of how the lens of our cameras might open up different reflective stances. I am one of those who needs that kind of constant reminders, as I am more apt to think in terms of words. 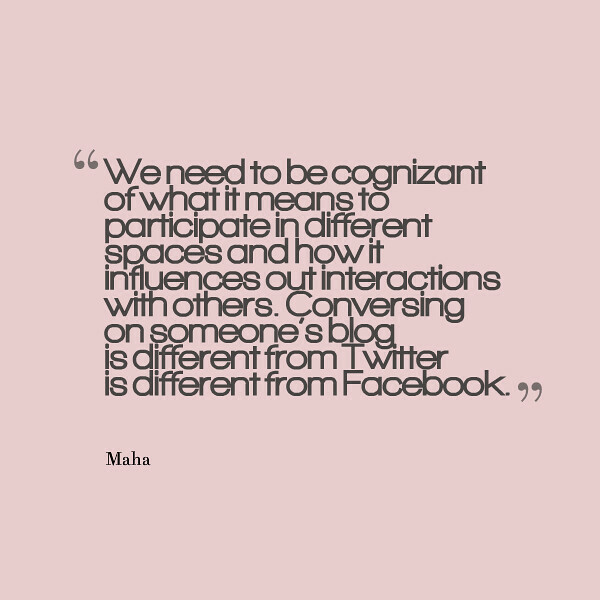 Maha Bali and I, and some others, have often had conversations around this idea of inclusion/exclusion, and how networked spaces and community ideas open or shut the doors on others. I love that she continues to push at that idea. It’s important in online spaces but just as important in our classrooms. Who feels welcomed? Who doesn’t? Kathleen is someone new to me but I love that she is science-orientated and her post about engaging in her first Twitter chat is such a great perspective. She tried something new. She is gearing up to try something new again. 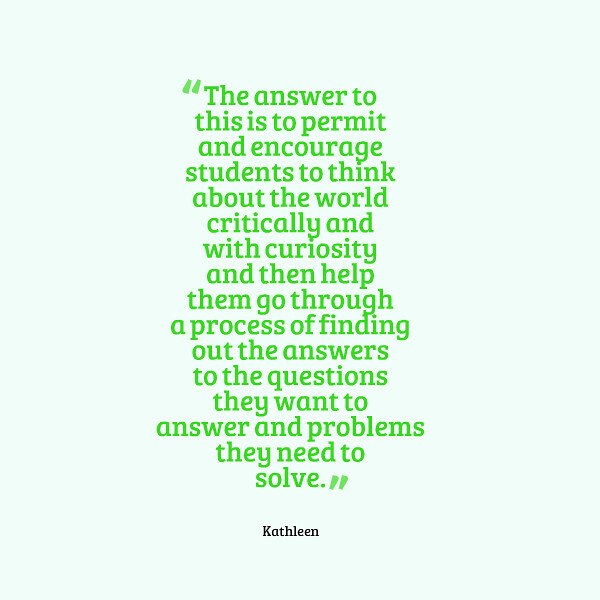 That’s the CLMOOC ethos. She is also engaged in the Make an Inquiry venture within CLMOOC (me, too) and I am grateful to have her perspectives. Jeffrey Keefer has been dipping into poetry this CLMOOC, inspiring others with the concept of liminality … that learning space in between the first step of the novice and the confidence of the expert. It reminds me of Vygotsky and zones of promixal development, and how important it is to navigate forward, even in uncertainty. His quote here is off-kilter because it comes from a poem. I left it because the off-kiltered essence seemed somewhat metaphorical to me. Barry Geltson was writing about an interaction with a friend, who made a quip about email. It reminded him, as it does me, of our role as teachers to find ways to encourage agency in our students in the wave of digital media. 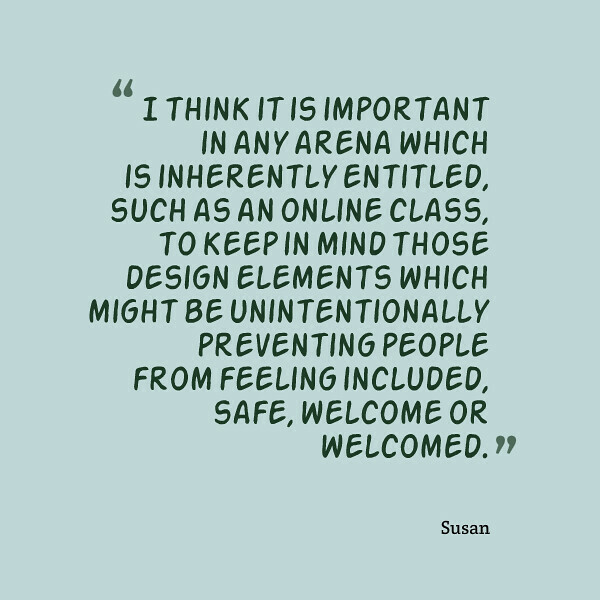 Like Maha, Susan Watson explores the idea of gateways and access in a post that blew me away with some new thinking of intentional designs in public spaces that have implications for us in digital spaces. The invitation in and who is the host …. we can’t ignore these ideas. 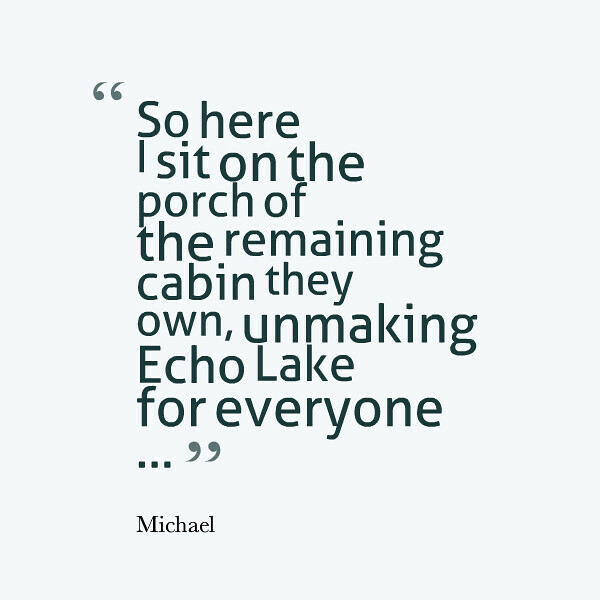 Michael Buist wrote a very personal post, about vacationing in Maine and the connections to family history. 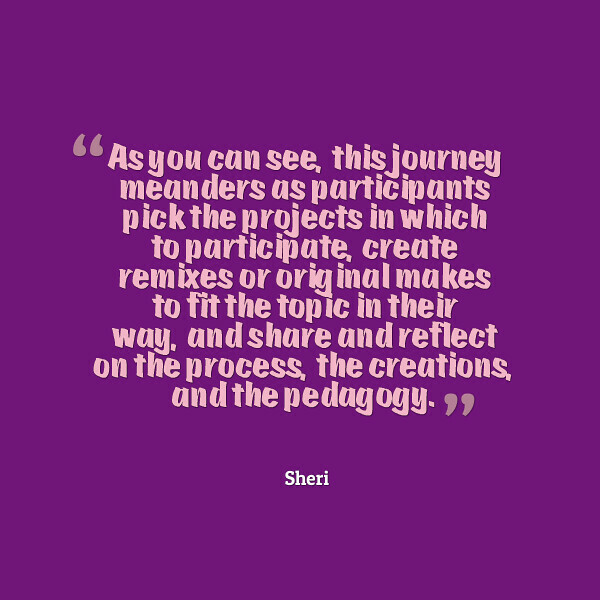 But in the midst of it, he had this line that resonated with me and with CLMOOC — he is bringing us into his experience while also inviting us to make our own. Thank you to all the bloggers in the CLMOOC Blog Hub. If you blog, add yours, too. The center of the CLMOOC is always YOU and if you blog, then consider opening the doors and invite us in. We promise not to wreck the place. We might remix a few things here and there but we will do it with caring and love. Thanks for including me in this piece. It’s so interesting hearing a parcel of my words used as inspiration for someone else. It’s impossible to navigate all of the postings. I so appreciate your finesse at doing this and sharing your close reading. Thanks. Thanks for sharing the quotes that caught your attention as you wandered across blogs. It’s this reflection that takes communities like #clmooc to a new level. Thank you Kevin! These are gems of clmooc and I’m honored to be included in your Blog Walk, which is another excellent idea! I did that earlier in the week, looking for people I might not know to connect with and encourage: I should have gathered quotes as well. Thank you for doing so; we at clmooc appreciate you.